As positive reinforcement trainers, we continually search for ways to create great partnerships with our horses. 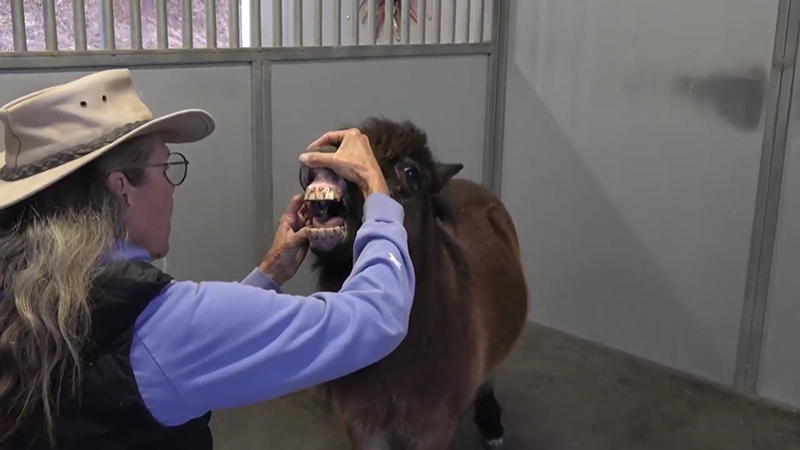 Watch this little horse “give permission” to examine his teeth and apply ointment by opening his mouth for Peggy Hogan of The Best Whisper is a Click. Join Peggy Hogan at ClickerExpo Portland to learn more! To check out all the equine courses at ClickerExpo, click here. After reading a scary story about a horse which got infected front teeth and they all had to be removed, I inspected my mule’s front teeth – he had black goo at his gumline. I took a hoof brush and asked him if I could brush his teeth? YES. But now I want to get a hoof brush dedicated to teeth, not feet, LOL. And since we already have good mouth behaviors I expect to add another, tooth brushing.